﻿ Portugal 2-0 Wales. One step closer to glory! 06.07.2016 » Portugal 2-0 Wales. One step closer to glory! Portugal have qualified to the EURO 2016 final after beating Wales 2-0 tonight in Lyon. Cristiano Ronaldo and Nani scored a goal each in the second half to secure the win for the Selecção. Next Sunday, the Portuguese Team can become European champions for the first time in their history. 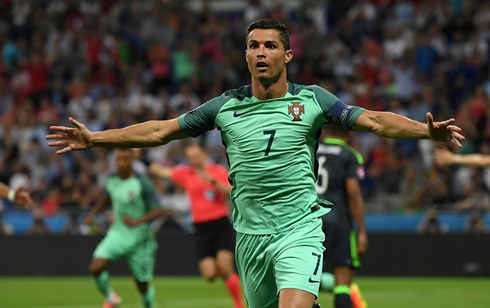 We may have had to wait for the EURO 2016 semi-finals stage to see Portugal winning a game in regular time, but Cristiano Ronaldo and his teammates certainly made all this waiting worth its time. The "Selecção" beat Wales 2-0 in Lyon this Wednesday night, reaching this tournament's final game for the second time in the country's history (the previous one was in the EURO 2004, where Portugal lost 1-0 to Greece). The Portuguese captain, Cristiano Ronaldo, shifted the fate of the game from a superb leap and header goal shortly after the break. Then and just 3 minutes later, he would assist Nani for Portugal's second goal on the night, which basically sealed the deal for Fernando Santos' men. Portugal are now one game away from winning their first-ever major tournament and they'll have to wait for tomorrow's semifinal game between Germany and France in order to know who is their last obstacle to glory in this EURO 2016. 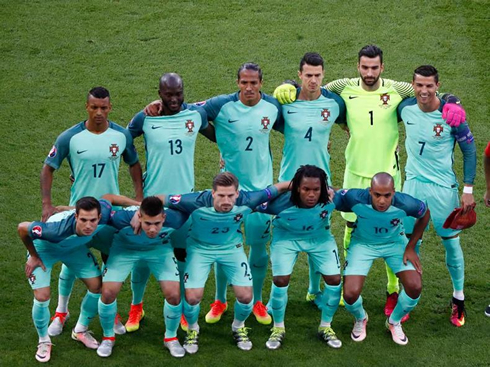 And just like that, Portugal are in the final of the EURO 2016. It took a magnificent header from Cristiano Ronaldo and an opportunistic finish from Nani to confirm Portugal's berth in the finals of the this summer's major tournament, but what a ride it has been so far! And just to think a few weeks ago how unlikely this all seemed... In a certain way, it's turning out to be a very similar journey to what Real Madrid already experienced this season in the UEFA Champions League. Leaping in the air and seemingly staying there forever, Ronaldo was able to finish one of his patented bullet headers past Hennessy in goal for Wales. It was his third of the tournament and his 9th all time in European Championship history (now tied as the the competition's all-time top scorer with Michel Platini from France). It was classic Ronaldo and it was the lift Portugal needed. Just a minute later and it would be 2, with Ronaldo again playing a major role. A speculative strike from outside the box found the foot of a sliding Nani, who diverted home the second and game-clinching goal. 2-0 Portugal and the dream of the Stade de France was quickly becoming a reality. 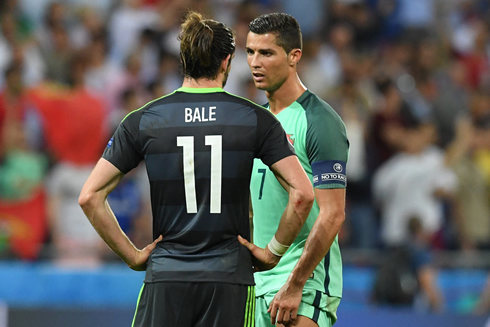 Wales tried as hard as they could to get into the game, but apart from a few long range strikes from Bale, they never really threatened. And alas Portugal were through to the final where they will face a formidable test in either favorites Germany or hosts France. And for Ronaldo, who has come under so much critici for both Real Madrid and Portugal in the past year, he has time and time again picked himself up and delivered when it mattered. Great stuff from CR7! Cristiano Ronaldo next game with Portugal is the EURO 2016 final on July 10 of 2016, against either France or Germany. You can watch Juventus live stream, Portugal live streaming, Celtic vs Barça, Man United vs Borussia Dortmund, Rapid Vienna vs Chelsea, and Germany vs France, all matches provided from our EURO 2016 live game pages.